It’s easy to go nuts for nuts. These delicious and specialized tree seeds have a satisfying crunch, a handy and natural small size, a creamy texture when blended, and add a distinct flavor to smoothies. Whether you enjoy them plain or made into a smoothie, these nuts are the healthiest for filling your stomach and adding flavor. Let get into our favorite nuts for smoothies and the nutritional profile of each. The Benefits of Nuts – Which Nuts are the Healthiest? All of these are common and can be easily found at any grocery store or natural health food store. Whenever possible make sure to purchase organic, raw nuts that are salt free. When you bring them home, give them a good wash and let them dry thoroughly to remove any remaining dust, debris, dirt, or pesticides. 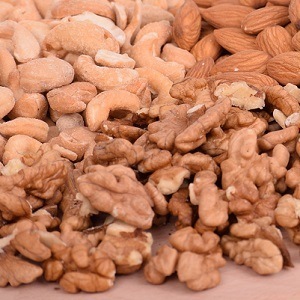 Compared to their size, nuts are high in calories. That’s because one of their primary ingredients is monounsaturated fats, the ‘good kind’ of fat. This fat is what your body uses primarily for fuel. This is contrary to animal fats, trans fats, partially hydrogenated oils, and saturated fats. 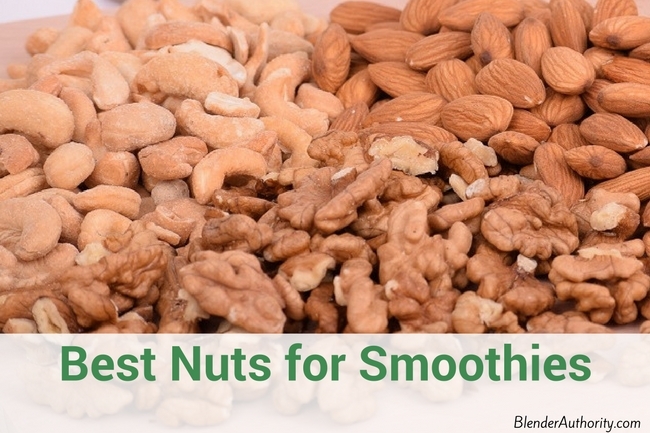 Here are several easy ways you can prepare your healthy nuts for smoothies. You can soak them to make them easier to digest, chop them to make it easier on your blender, or blanch them to skin them. Soaking nuts before putting them in smoothies can them easier to digest and can improve their nutritional content. It removes the enzyme inhibitors inherent in many nuts. Place the nuts into a glass bowl and cover them with warm distilled or purified water with a teaspoon of sea salt. Use two parts water to one part nuts. The warm water and salt makes the nuts more digestible and activates beneficial enzymes. At room temperature and covered with a cotton breathable cloth, let the nuts soak. A general guideline to follow is almonds take 8-12 hours, cashews take 2-4 hours, pecans take 6 hours, and walnuts take 4 hours. After soaking, rinse them and dry them. Then add to your smoothies! Almonds have a fine brown skin on top of the actual nut. To remove this skin and blanch them, you will first bring a small saucepan of water to a boil. Place raw almonds directly into the water and boil for exactly 60 seconds. Drain immediately and wait for them to cool. Then gently squeeze each almond to remove the brown skin. When you blend almonds, walnuts, cashews, pecans, or peanuts into a thick paste, you’ve effectively created a nut butter. Processed nut butters, like those made from brand name companies, contain oils, a high sodium content, sugars to sweeten, and fillers like mono and diglycerides which are meant to bind the ingredients together. If you want a nut butter in your smoothie, you’re better off making it yourself. Just add raw nuts to your food processor or blender and blend until smooth. Then, you can add a little salt and oil to your taste if needed. Raw nuts, especially organic raw nuts, are much healthier than processed nut butters. Be sure to purchase unsalted and plain nuts. They’ll easily go into your blender to make smoothies and will add a lot of nutrition and creamy texture. As mentioned earlier, four of the healthiest tree nuts that we use in smoothies are almonds, walnuts, cashews, and pecans. Each have their own distinct flavors, nutritional profile, and different distribution of fats, proteins, carbohydrates, vitamins, and minerals. Almonds are rich in important nutrients as well as high in protein and healthy fats. Almonds are a good source of copper, B2 vitamin, magnesium, Vitamin E, manganese, and more. Almonds are a great source of healthy energy and are low on the glycemic index. Ideally buy RAW almonds not roasted for the most nutrition. Almonds are best stored in a glass jar in the fridge. One ounce of almonds contains 161 calories, 3.5 grams of fiber, 6 grams of protein, 9 grams of monounsaturated fats, 37% of your RDA (recommended daily allowance) of Vitamin E, 32% of your RDA of manganese, and 20% of your RDA of magnesium. Walnuts are considered one of the healthiest foods in the world. They are an excellent source of important fatty acids and have a high amount of healthy Omega 3 fat. Walnuts have been studied for brain health, fighting inflammation, improving cardiovascular health, and lowering cholesterol. Other benefits of Walnuts is they help with sleep (Melatonin) and are an excellent source of antioxidants. You can eat walnuts on their own after taking them out of their shells, or you can roast them or bake with them. Walnut oil is made from extracting walnuts. Walnuts can go bad (especially shelled walnuts) so when purchasing walnuts from the bulk section in your local grocery store make sure they look, smell, and feel fresh. A one ounce serving of walnuts equals 182 calories, 4 grams of protein, 2 grams of fiber, 18 grams of monounsaturated fats, and a high Omega-3 fatty acid and Omega-6 fatty acid content. Omega-3 and Omega-6 are heart healthy ‘good fats’ that are beneficial for burning and fuel for the human body. Technically cashews are “seeds” that grow from the apple fruit of the cashew tree. Their flavor is both sweet and salty, with a creamy texture. They make a great alternative to peanuts or almonds if you are want a nut butter. Cashews are low in fiber but also low in fat relative to other nuts. Cashews are nutritionally dense and provide a wide range of important vitamins and minerals. They have have been found to help lower bad LDL cholesterol levels and one study found that compounds in the cashew nut can improve glucose uptake in cells which benefits diabetics. Make sure to buy raw cashews for the highest levels of nutritional content (Roasted cashews will have lower nutrition). Cashews are always sold without the shells because the shells are toxic. They have a longer shelf life than many other nuts but make sure to smell and inspect the cashews if buying bulk to make sure they have not gone rancid. One ounce of cashews contains 157 calories, 12 grams of monounsaturated fats, 8.56 grams of carbohydrates, 5.17 grams of protein, and many vitamins and minerals, including copper, manganese, magnesium, phosphorus, and vitamin B6. The pecan is another tree nut, and it grows in warm climates such as the American South, where it’s especially popular. Pecans contain a nutrient called polyphenols, which are organic compounds that act as antioxidants. Pecans have a taste like walnuts and are typically sold without their shells. They are commonly consumed raw or roasted. They are a great source of healthy fats unsaturated fats , protein and Vitamix E. They are also rich in vitamins, minerals and natural antioxidants. Pecans have been studied for their healthy fats and shown to help protect the nervous system by delaying certain age related ailments. Pecans are rich in manganese(good for the heart), copper(important for energy in the cells), zinc (for proper body function and healing), thiamin (converts carbs into energy), and more. Pecans do have higher levels fats like Omega 6 so eat them in moderation. Pecans don’t typically store well due to their fat content so it is recommended to keep them in the refrigerator for longer shelf life. One ounce of raw pecans contains 193 calories, 20 grams of monounsaturated fat, 3 grams of protein, 4 grams of carbohydrates, and 2.5 grams of fiber. Although all four varieties have proteins, the best nuts for protein are almonds and cashews. Adding a handful of healthy raw nuts into your daily smoothie is a a great idea and will help provide a more complete nutritional profile to your smoothies. The four nuts mentioned above are all excellent choices but feel free to add in your favorite alternative nut. Just make sure to to only buy raw, natural nuts and prepare them properly for improved nutrition. Discover the 4 best nuts for smoothies and why we like them so much. Also learn how to prepare and select the right nuts for proper health and safety.